Rampant Cats Sampler, The [W6156] - $15.98 : Yarn Tree, Your wholesale source for cross stitch supplies. Cross stitch design by Barbara Ana Designs. 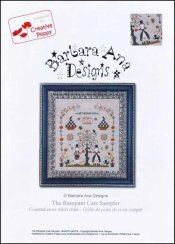 The traditional looking sampler is full of unexpected surprises, such as the ones Barbara Ana loves to place in her designs. Look closely and you will notice that the gentleman and the lady differ from Adam and Eve, not only because they are fully dressed, but because they seem to be tempting the snake, not the other way round, and further more they are holding a pumpkin! The are many interesting details to stitch in this rather large sampler such as the rampant cats that seem to be levitating on their hind legs. Colors have been very carefully selected by Barbara Ana for this sampler. In two areas, she uses a combination of 2 strands in different colors so as to create the exact hue she is looking for. Stitch count 157 x 184. Stitched on #4138 Belfast Raw Linen.